If you’ve been on Pinterest for awhile, you’ve probably seen this recipe from Smitten Kitchen floating around. It was one of the first things I ever pinned. I mean, just reading the name? It says YUM. But for some reason, I didn’t try it out right away and over time it had slowly sunk into the depths of my mind only to resurface after I saw that Gail had made some. Yes, what a perfect treat to make for myself for Mother’s Day! Ha! So I did. And they were amazing. And I can say that because they were not amazing due to any talent of mine, but simply because it is a fantastic recipe. It’d be pretty hard to screw these up (though I nearly did, but we don’t have to talk about that). The only adjustment I made was increasing the salt amount (per Gail’s suggestion). It calls for a heaping 1/4 teaspoon and I think I added about a 1/2 teaspoon. Just depends on how subtle or strong you want that salty kick to be. 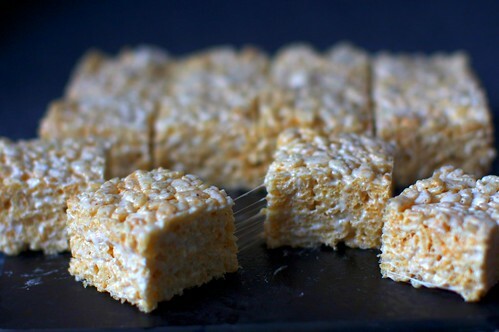 These are regular rice crispy treats that have been smothered with the flavor of warm browned butter and have a kick of salt. Salty-sweet is my favorite combo. This recipe takes the classic kids treat and adds just the right amount of sophistication that makes it totally appropriate for an adult only affair, but still kid-friendly enough for the little ones. 1. 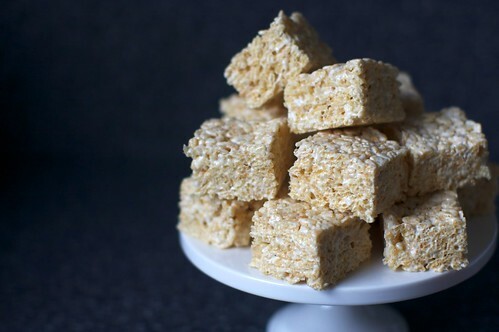 Simple ingredients: This recipe requires 4 ingredients, 2 of which you probably already have at home (coarse salt and butter) and the other two are inexpensive and readily accessible (marshmallows and crispy rice cereal). 2. Easy: Melt. Mix. Spread in pan. It really can’t get easier than that. 3. Fast: These can be made in less than 30 minutes. 4. Delicious: They got thumbs up from everyone who tried them and we ended up making 3 batches over 3 days (for family, friends and co-workers) and all have been devoured. 5. Travel well: I’ve had a hard time transporting cakes, cupcakes, pies, tarts, etc. – always worried about frosting smudging or pies tilting or trying to find the perfect box or container to carry it in. But not these babies! Just throw them on a plate with plastic wrap over it or in a plastic container and they will not lose their shape or smudge or look any less perfect than they did at home. THIS IS SO IMPORTANT TO ME. The ONLY thing that would make this recipe any better is if it was healthy. Which it is not. But you can’t win ’em all, can you? So if my friends and family are reading this, I hereby claim this recipe to be MINE for all future potlucks and parties from now until eternity. Thank you. I’d love to come back and share “Golden Recipes” with you every once in awhile, but quite frankly, I’m not sure if there will be any to compete with this one. Do you have any go-to recipes? Please share! This entry was posted in food, Golden Recipes and tagged food, golden recipe, rice crispy treats, smitten kitchen by Cherie. Bookmark the permalink. Oh man, brown butter makes everything better! ohhhh i’m so glad you made these! they really are pretty perfect, right? good to hear you upped the salt – i’m going to go for a full 1/2 teaspoon next time. my mouth is watering!! yummmmm. Salty sweet is my favorite, too. Gotta whip some of these up! Thanks for sharing, I hadn’t seen this recipe before.